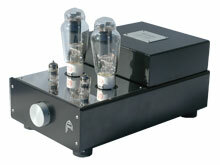 Audion Silver Night Anniversary 2A3 hard wired stereo is our intermediate leve lpower amplifier, using the well known 2A3. 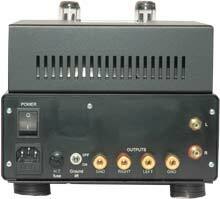 This amplifier is hand built and point to point hard wired (Air Wired©) avoiding the use of Chinese components where possible. This triode based stereo amp uses no (zero) feedback in the design. The chassis is black powder coated aluminum as is the transformer cover. The top plate and badge are mirror finished stainless steel. The Silver Night range of amplifiers are the best known of the Audion products, and the ones that have won most awards, notably amp of the year in Japan 2010. The SN 300B hard wired was the amp originally reviewed by Sam Tellig that put Audion's name onto the map. Having a volume control on the front and stereo inputs on the rear means that a pre-amplifier is not necessary with this unit, but is advised . These amps are all auto biased. The 2A3 uses either Sovtek or Electro Harmonix. The Silver Night Stereo range can reproduce subtleties and nuances in music that can not be found in other amps of this price. The 300B gives a good overall sonic performance from a well know tube, the 2A3 delivers less power and is suited for loudspeakers really over 97db efficiency, they can be used with speakers of less efficiency but will "run out of steam" quicker. The 2A3 is a good amp to use with Horn loudspeakers as it has an extra 2 power supply stages and is quieter (less than 1mV noise). All of these amps are wired for 8 ohms, however they have a 4 ohm tapping that can be changed internally. The Silver Night Anniversary is built with components sourced from Europe and the US. Where possible we avoid the use of any Chinese component. Our output transformers are wound in-house to our exacting standards and many of the components are either made by us or specifically for us. We use JJ 300B and Russian New old stock 6H1N as a driver and input tubes. As the brand name is so well known this is the most popular selling amp in our line-up and the one that wins hearts and minds. The current Silver Night Anniversary is now 5th Generation product, originally being sold in 1987.